While he was as innovative as Jimmy Page, as tasteful as Eric Clapton, and nearly as visionary as Jimi Hendrix, Jeff Beck never achieved the same commercial success as any of his contemporaries, primarily because of the haphazard way he approached his career. After Rod Stewart left the Jeff Beck Group in 1971, Beck never worked with a charismatic lead singer who could have helped sell his music to a wide audience. Furthermore, he was simply too idiosyncratic, moving from heavy metal to jazz fusion within a blink of an eye. As his career progressed, he became more fascinated by automobiles than guitars, releasing only one album during the course of the ’90s. All the while, Beck retained the respect of fellow guitarists, who found his reclusiveness all the more alluring. Beck began his musical career following a short stint at London’s Wimbledon Art College. He earned a reputation by supporting Lord Sutch, which helped him land the job as The Yardbirds‘ lead guitarist following the departure of Eric Clapton. Beck stayed with The Yardbirds for nearly two years, leaving in late in 1966 with the pretense that he was retiring from music. He returned several months later with “Love Is Blue,” a single he played poorly because he detested the song. Later in 1967, he formed the Jeff Beck Group with vocalist Rod Stewart, bassist Ron Wood, and drummer Aynsley Dunbar, who was quickly replaced by Mickey Waller; keyboardist Nicky Hopkins joined in early 1968. With their crushingly loud reworkings of blues songs and vocal and guitar interplay, the Jeff Beck Group established the template for heavy metal. Neither of the band’s records, Truth (1968) or Beck-Ola (a 1969 album that was recorded with new drummer Tony Newman), was particularly successful, and the band tended to fight regularly, especially on their frequent tours of the U.S. In 1970, Stewart and Wood left to join the Faces, and Beck broke up the group. Beck had intended to form a power trio with Vanilla Fudge members Carmine Appice (drums) and Tim Bogert (bass), but those plans were derailed when he suffered a serious car crash in 1970. By the time he recuperated in 1971, Bogart and Appice were playing in Cactus, so the guitarist formed a new version of the Jeff Beck Group. Featuring keyboardist Max Middleton, drummer Cozy Powell, bassist Clive Chaman, and vocalist Bobby Tench, the new band recorded Rough and Ready (1971) and Jeff Beck Group (1972). Neither album attracted much attention. Cactus dissolved in late 1972, and Beck, Bogert, and Appice formed a power trio the following year. The group’s lone studio album — a live record was released in Japan but never in the U.K. or U.S. — was widely panned due to its plodding arrangements and weak vocals, and the group disbanded the following year. For about 18 months, Beck remained quiet, re-emerging in 1975 with Blow by Blow. Produced by George Martin, Blow by Blow was an all-instrumental jazz fusion album that received strong reviews. Beck collaborated with Jan Hammer, a former keyboardist for Mahavishnu Orchestra, for 1976′s Wired, and supported the album with a co-headlining tour with Hammer’s band. 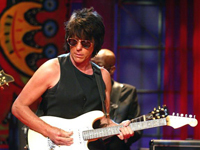 The tour was documented on the 1977 album Jeff Beck with the Jan Hammer Group — Live. After the Hammer tour, Beck retired to his estate outside of London and remained quiet for three years. He returned in 1980 with There and Back, which featured contributions from Hammer. Following the tour for There and Back, Beck retired again, returning five years later with the slick, Nile Rodgers-produced Flash. A pop/rock album recorded with a variety of vocalists, Flash featured Beck’s only hit single, the Stewart-sung “People Get Ready,” and also boasted “Escape,” which won the Grammy for Best Rock Instrumental. During 1987, he played lead guitar on Mick Jagger‘s second solo album, Primitive Cool. There was another long wait between Flash and 1989′s Jeff Beck’s Guitar Shop with Terry Bozzio and Tony Hymas. Though the album sold only moderately well, Guitar Shop received uniformly strong reviews and won the Grammy for Best Rock Instrumental. Beck supported the album with a tour, this time co-headlining with guitarist Stevie Ray Vaughan. Again, Beck entered semi-retirement upon the completion of the tour.